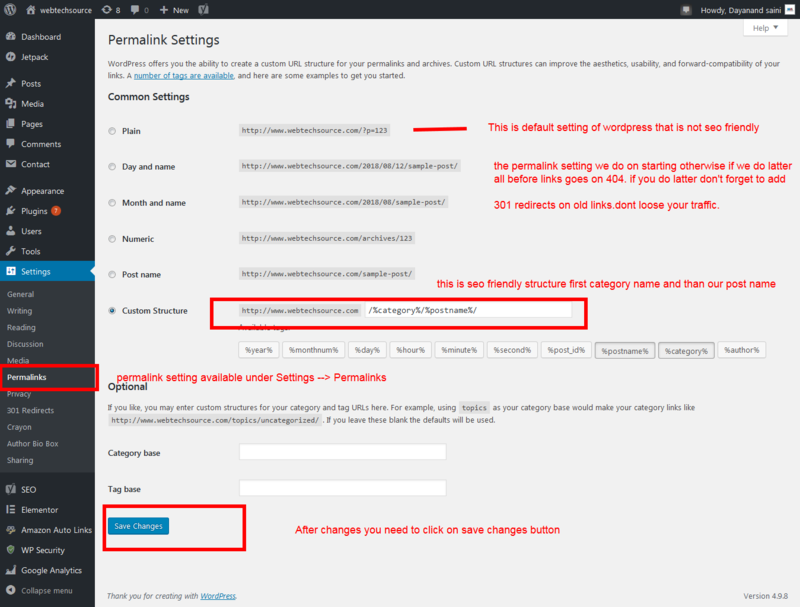 This default permalink is not search engine friendly, so most bloggers just starting with WordPress fail to create a site that is optimizing WordPress permalinks for SEO because they are using the default permalinks. permalink structure is recommended for optimal SEO? Plain : https://www.webtechsource.com/?p=123 Day and name : http://www.webtechsource.com/2018/08/12/sample-post/ Month and name : http://www.webtechsource.com/2018/08/sample-post/ Numeric : http://www.webtechsource.com/archives/123 Post name : http://www.webtechsource.com/sample-post/ Custom Structure : Choose your own URL structure using available tags. We can change the structure of your permalinks at any time. changes in the URL of your pages. After changes the url all our url goes on 404 pages. all visitor goes on 404 pages that harms our website and increase 404 page. 301 redirects can stop the impact of a change in permalink structure we need to all old url to new url of our website with 301 redirect. If you’ve decided that you do want or have to change your permalink structure, you’ll need to take a few steps. Step 4 : Re indexing your sitemap to all search engines that will very helpful.